Doctor Who's rich five-decade history means that a plethora of references to the classic series is pretty much inevitable. This was especially noticeable in series 7--understandably so because 2013 is Doctor Who's 50th anniversary year. It would have been far more surprising and undeniably disrespectful if the writers had chosen to ignore that history. 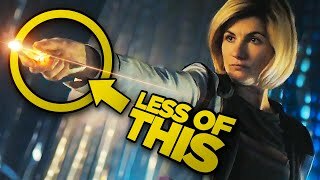 For those unfamiliar with the classic series, though, the references in this and previous series may raise more questions than the timey-wimeyest of plots, questions like "How far back did the Doctor and Sarah Jane go?" or "When did the chameleon circuit first break?" or "Has the Doctor always had the sonic screwdriver/psychic paper?" But there are historic moments in Doctor Who's history it would be a shame to miss as well, such as the Daleks' first appearance or the initial introduction of the Valeyard (and how he relates to the Doctor). There's even an episode where the Doctor fixes the chameleon circuit! Just about all of these things have been referenced in some shape or form in the modern series, and watching the classic series can make those references less obscure.